I have a special and probably perverse affection for the Lincoln Portrait. The combination of spoken word and orchestra is more reliably moving than the sung word. Whether it is Vaughan Williams in Oxford Elegy or Thanksgiving for Victory, Prokofiev/Stasevich's Ivan the Terrible or Eugene Onegin or Bliss's Morning Heroes (recently heard, courtesy of Reg Williamson, spoken with a German oration - poignant indeed) great or even mediocre words make the most telling of effects. 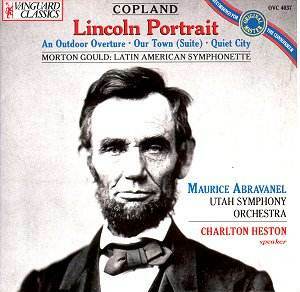 Lincoln Portrait was at one time Copland's most played piece. It has been recorded by celebrities of all brands: actors, politicians and soldiers. The roster includes Gregory Peck, Katharine Hepburn, Henry Fonda (recording made in 1968; discounting versions spoken in Spanish and Portuguese the only one conducted by the composer), James Earl Jones (leading the field on Delos), Norman Schwarzkopf and Margaret Thatcher. It is worth noting that Lincoln Portrait was one of a series of works commissioned by conductor, André Kostelanetz. The others have not fared at all well. Whatever happened to Virgil Thomson's Mayor La Guardia Waltzes, John Becker's Lincoln's Gettysburg Address for speaker, chorus and orchestra and Jerome Kern's Mark Twain 'portrait'. This most patriotic and least bombastic of pieces was banned for some years when Copland was under the hammer of Senator MacCarthy's House Un-American Activities Committee. A performance slated for President Eisenhower's inauguration was cancelled for the same reason. Abravanel's first trumpet sings a gloriously calming legato over Gettysburg fallen scene-setting and scene-stealing for the climactic words. Heston takes chances - speaking for the most part in a quiet slow drawling voice without exaggeration allowing telling effects to be carried by the alchemical catalytic effect of words and music. There is some distortion in the sound in the louder passages of the Portrait and a roughened tone to the strings in alt. The angelic Utah trumpet also carries the day in the more refined, less populist and even hesitant Quiet City. That cooling trumpet floats lovingly over the 'jog-trot' of the strings in Outdoor Overture. The Overture is a classic of entertainment music and while the Vanguard does not have the zip and snap of Copland's own version on Sony, Abravanel turns in a zestful version with a more sensitive reaction to its poetry (melting clarinet playing towards the close). Did Moeran hear the Copland before he wrote his brilliant Overture to a Masque? Did Copland hear Bliss's score for the film Things to Come before writing the overture? Speaking of film music we come to a miniature suite from Our Town (1940) - pastoral sampler Americana. Abravanel stands away from the dodecaphonic Copland. I am afraid that in this company the Gould piece seems the musical equivalent of flat and warm beer and the problem is not with the Salt Lake City orchestra!